To get 50,000 Club Carlson points I needed to stay at a Radisson Hotel, but I didn’t have any immediate travel plans. So a stay at the Radisson in Calgary was in order, which I did last night. The main restaurant is called botaniCa (their use of capitals) which is accessed from the hotel lobby. I was in at 06:30 on a Sunday morning, apparently the first person they’d had in that morning, but they’re open from 05:00 everyday. The restaurant is clean and tidy, with a partially open kitchen. The seating and tables are contemporary, nothing too fancy just well laid out and didn’t feel at all cramped or difficult to navigate around other tables. Windows along the southern side of the restaurant look out onto the carpark and the Trans Canada Highway, but in this area you’re not likely to find anything better. It was snowing and not yet light, so everything looked clean and crisp outside. Service was good, with prompt attention and an offer of a newspaper as soon as I sat down. Coffee was of the brewed variety, using Starbucks beans. With sugar and cream this is not a bad cup of coffee, and tastes a lot better than when places without a decent barista tries to make espresso coffee. The stainless steel insulated pot was left on the table, along with the cream jug to allow me to top up at my own convenience. The only thing that would have been nice is if a glass of water had been offered or provided, but no big deal that it wasn’t. With my coffee I had the traditional Eggs Benedict. The hollandaise tasted freshly made, thick and tasty. No sour note was to be detected in this sauce, which is how I believe it should be. The poached eggs had a very slight vinegar taste on the first bite, but was gone after that. I’m guessing a little too much was used to keep them nice and firm during poaching. To my mind the dish wasn’t quite traditional as it came with bacon rather than ham (yes I am that fussy), but it was cooked such that it was soft and not dis-similar to ham in texture. The hash browns were large cut and very warm, very nicely done. On the side was a couple of pieces of melon, a strawberry and a shot of their berry smoothie. Total cost for the breakfast, including tip and tax was $20. 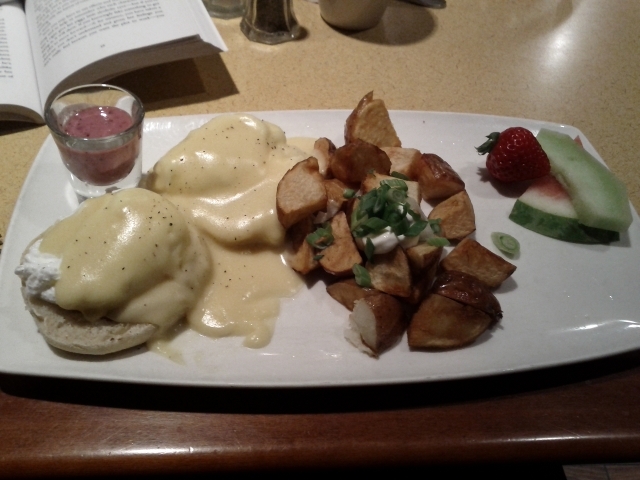 I enjoyed this breakfast and would happily return if I ever find myself up in this part of Calgary again.